There is nothing better than the smell of a fresh loaf of bread baking in the oven. I love to make specialty breads for my family. It’s simple and a great way to use up leftover fruit in my house. 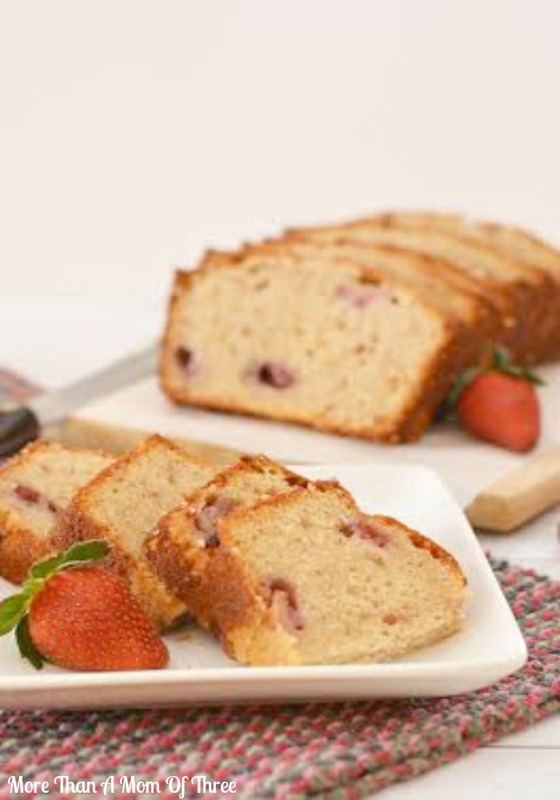 Today I have a delicious strawberry bread for you. 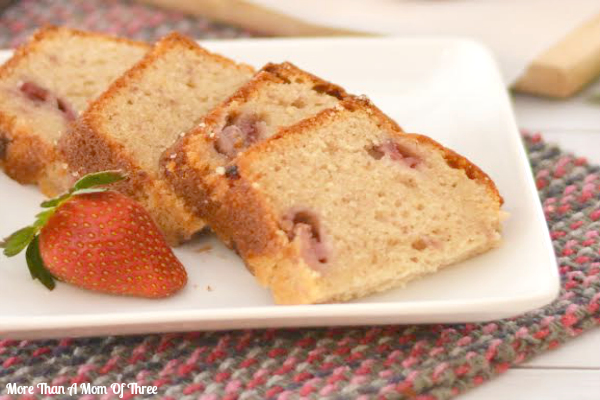 It’s simple and makes a yummy treat for breakfast or a late afternoon snack. 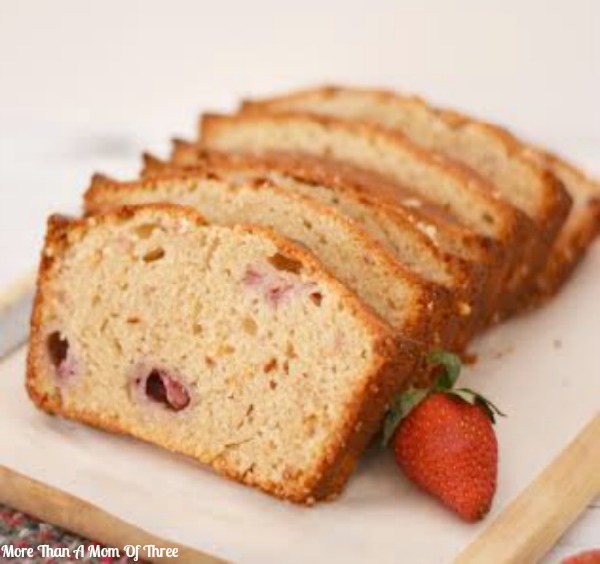 My kids absolutely LOVE strawberries so they devoured this strawberry bread within a couple of days. When my picky eater CJ likes it, I know its a keeper. 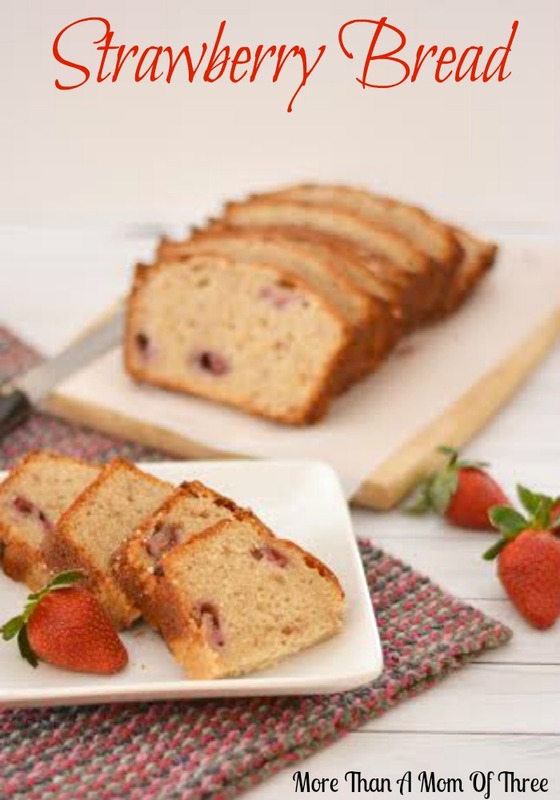 It is a super sweet bread melts in your mouth and then bursts with strawberry flavor. If you like strawberries then this one is a must try. In a mixing bowl, cream butter, sugar and vanilla together until fluffy. About 2-3 minutes. Add each egg, one at a time, beating well after each egg. Add preserves and sour cream and mix well. Add flour, salt, baking soda and cream of tartar and mix until blended. In a separate bowl, mix cut strawberries with 1-2 tablespoons of flour or until evenly coated with flour. Bake for 50-60 minutes or until golden brown and center is clean when toothpick is inserted. Let cool for about 10-15 minutes in pan before removing.